Highly revered former Nigerian president, Olusegun Obasanjo has spoken up about the effect of Ebenezer Obey's music on him. 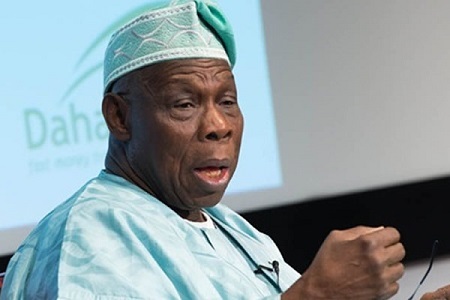 According to Vanguard, Obasanjo said whenever he was finding it difficult to sleep or while doing a serious work, he would have Obey-Fabiyi music playing slowly at the background. Speaking at the reception held inside the marquee located in the Presidential Library, Abeokuta. The former President also noted that the musician in his over three decades on the Nigerian performing stage had taken Nigerian music to the global podium He said music legend has maintained decorum and decency in his conduct and content as an artiste and musician. He said he has elevated God through his music and impacted positively on the society. He said, “His life on one hand depicts the grace of God and on the other hand , it teaches determination, hardwork and perseverance. “One of the important lessons to be learnt from his life is that there is no height a man cannot attain once he is focused. He commended Obey-Fabiyi for his initiative to give back to the society through Ebenezer Obey Music Foundation and Training Institute, which he inaugurated at the reception. Meanwhile, the Ogun State governor, Senator Ibikunle Amosun has disclosed that his administration was planning to build a museum in honour of Obey. Amosun announced this at the interdenominational church service held at the Chapel of Christ The Glorious King, inside the Olusegun Obasanjo Presidential Library, Abeokuta marking the 75th birthday of the music icon. The state governor noted that the Obey-Fabiyi’s music taught totality of life and it has moved beyond Nigeria to the entire global community. He said when he travelled to the United States of America, he saw the works of the Ogun State-born music displayed in a shop in New York. Amosun said he never failed to listen to his music every morning before setting out for the office, because there was always a prayer or a philosophy, which could serve as driving force for the day. He said, “All I see in him at 75 is the awesomeness of God in his life. There is always something to learn from your music. I play Ebenezer Obey-Fabiyi’s music every morning(he sang some songs of the musician). The General Overseer,Redeemed Christian Church of God worldwide,Pastor Enoch Adeboye said he has followed the musical career of the music icon right from his miliki days. He explained that both himself and Chief Obey-Fabiyi became born again Christian at about same period. While using some verses from Psalms 71 and 73, he asked for God’s guidance, protection and strength for him as he said King David asked God when he was getting old. The cleric who’s also the General Overseer, Sword of the Spirit Ministries, said in every human being’s life, there were three seasons – morning, afternoon and evening, adding that all mortals would want their evening to be better than morning. Responding, the host, said God had endowed him with musical talent and sent him on a mission as a musician with message of love, peace, hope and progress. 0 Response to "I Use Ebenezer Obey's Music as Sleeping Pill - Olusegun Obasanjo Opens Up"